KANSAS CITY, Mo. 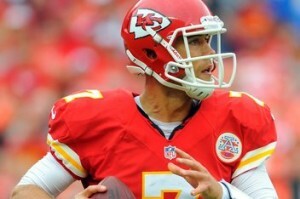 (AP) – Kansas City quarterback Matt Cassel, who sat out last week’s game at Tampa Bay with a concussion, has been cleared for non-contact practice and could play in the Chiefs’ next game on Oct. 28 against Oakland. If Cassel does get the start, it could trigger a quarterback controversy. Never very popular with fans, Cassel’s stock has hit rock-bottom in Kansas City after he threw nine interceptions and had a hand in many of the team’s NFL-leading 19 turnovers the first five games.